Phrases are like musical ‘sentences’, and, a phrase in music expresses a complete idea. In classical music, phrases are symmetrical in length, but in modern music a phrase can be any length. Phrasing helps to shape the music, and to give it life, form and ‘punctuation’. Phrasing relates to the way in which individual notes in a group of consecutive notes are played, and represents the many deviations and adjustments the musician needs to make to bring expression (feelings) to the music, to demonstrate stylistic and cultural awareness (i.e. “where the music comes from”, the context of its composition, and the style of music – e.g. Romantic, Baroque etc). Musicians need to shape (“phrase”) the music in such a way that is obvious and detectable by the listener. Phrases are usually marked with curved lines (called slurs), indicating that a particular group of notes “belong” together as one musical idea. These can also be legato markings, but not always; notes may be marked staccato under a slur. 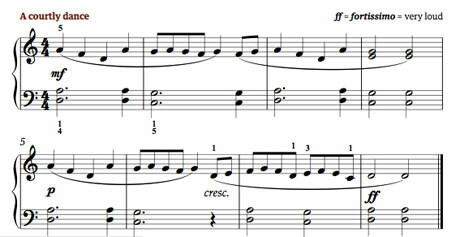 Sometimes, though, no phrases are marked and it is up to you as the pianist to work out where the phrases should be. Composers sometimes include dynamic markings in a phrase to show you how they would like you to shape the music. For example, if the music moves up in pitch (gets higher), the composer might put a sign to get louder (crescendo), with a sign to get quieter (diminuendo) as the music moves down in pitch (gets lower). You can get a good idea of how to shape a phrase by singing it out loud: the human voice rises and falls naturally, and the end of a phrase is where you would take a breath if you were singing it. Music that comes from the Baroque period (17th and early 18th centuries), by composers such as Johann Sebastian Bach, tends not to have any phrase markings – or indeed any other markings (unless these have been added by an editor; a score without editorial additions is called “urtext” meaning “original”). This was quite normal for the time: the composer would expect the musician to know how to shape the music, where to add staccato, legato, to get quieter or get louder, and so on. Intuitively – i.e. by feel or sense of the music. Intuitive phrasing borrows from the phrasing in spoken and punctuated language – the rise and fall of the voice, the speed of speech. Chopin once said to a student, “he who phrases incorrectly is like a man who does not understand the language he speaks.” If we listen to ourselves and others speaking, we notice that we do not speak in a flat, monotonous way, at the same speed the whole time. Just imagine what we would sound like if we did: very boring! Likewise, music can be shaped, “punctuated” in the same way as language. Analytically – relying entirely on the written score and one’s knowledge of the way music is structured. In reality, we probably use both approaches when attempting to phrase music, though the intuitive approach is more useful, in my view, as it produces a more natural result. Phrases end with a ‘breath’. The last note of a phrase is the quietest. The peak is often found on the long note of a phrase, or the highest note of a phrase. Never play two notes in a row at the same level. Two-note slurs (“drop slurs”) are always louder then softer. Next postHow many hours a day should you practice? That Bach is easy-ish to shape on a harpischord – but a fascinating challenge to shape on a piano, I think. Every since I saw the Werner Herzog film, Herdsmen of the Sun, where it appears in its Bach-Gounod manifestation, it has reminded me of those people, living in the Sahara. I often tell children I teach that playing music is like being your own Dr Who and having a “tardis” – it can transport you off anywhere in time and space. For example, you can’t smell the court of Henry VIII (and I’m not sure I’d want to) but you can hear the sounds he heard and, as a musician, fully occupy yourself in what he did. I was thinking this only the other week. I walked into a room at Wordsworth’s House in Cockermouth where there was a harpsichord. You were allowed to play it so I had a go. I played some Handel. Then I read a note on the instrument that said it was a replica of an instrument that had belonged to Handel – so I played it again! A real Dr Who moment. I love the Dr Who image: will have to use this in my lessons. I tell the children the piano can be any instrument they want it to be – some clearly don’t believe me until we make trumpet sounds on it! 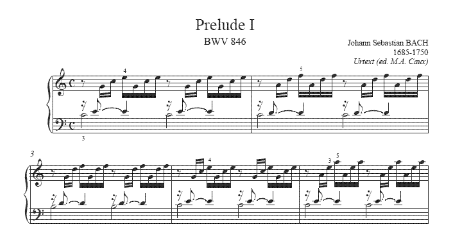 I’m not sure the Bach Prelude is the best example of an urtext score but you’re right: it is quite hard to shape on the piano. I get students to play the arpeggios as block chords so they can hear the changing harmonies & then we talk about what mood the sounds evoke and what kind of dynamics might be appropriate. Funnily enough, I have just started looking at the Bach-Gounod with my violinist partner. Will be interesting to see what images it conjures up for me!